I try not to quit things. I've never been one for giving up. Well, it's about time I changed that. My biggest barrier to success next year is my weight. I'm not a particularly fat bloke, this morning I was 86.7kg (which is in the healthy BMI range if you're comfortably over 6' like I am). I've been a lot more - I was around 100kg a couple of years ago when I first started caring about these things. Anyway, the biggest barrier to performance is weight. 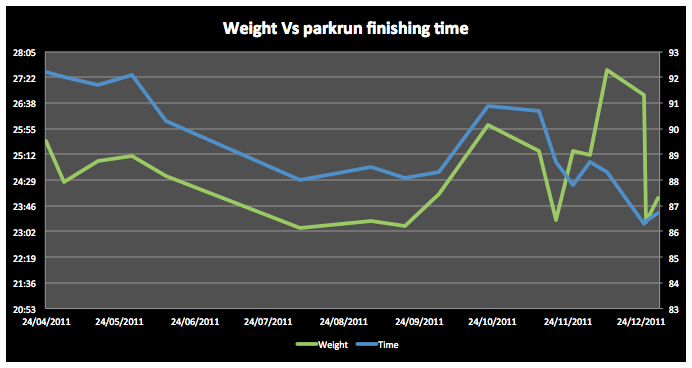 I plotted my parkrun times against the weight I was on that day. I was absolutely shocked at the direct correlation. The lighter I am the faster I am. The biggest (certainly my biggest) barrier to reaching my race weight (whatever that turns out to be!) is alcohol. However, it's not just the alcohol, it's everything that comes with it. You consume absolutely bucket loads of empty (useless) carbs during a night on the lash. The sleep you get afterwards is poor quality so you wake up tired, and it's not restorative so you don't benefit from the exercise you got that day so much. The next day you're knackered and more likely to crave yet more junk carbs. I really enjoy a night on the town on days where I've had fantastic training sessions (full to the brim with happy-happy endorphins) and that's absolutely the worst way to "recover" from a good session, undoing all the good work and then some and not giving your body the fuel and nutrition it craves to rebuild after the damage of exercise. As if that wasn't bad enough, I'm less likely to complete the sessions I had scheduled for the next day (and if I do make it, it will be a junk session due to me being knackered and weak). I'm incapable of doing things by halves, so "no more than two pints" or "just once per week" will never work, I know myself too well to kid myself that such initiatives will ever succeed. No more alcohol until after IM Wales. I'm usually strong like ox, but lately seem to have really suffered from several bouts of illness - tooth problems, a few colds, and a weekend of norovirus that I'd really rather forget. I've hardly had any exercise for the last two weeks. Today is Christmas Day (Merry Christmas!) and I decided to blow away the cobwebs with a short drive over to Bushy Park, and a Christmas Day parkrun. 630 other people turned out for the free 5km run, smashing all previous Christmas Day records. A gentle trot round was planned (last time I ran was 13 days ago), and I kept to it. Cruised round in a little over 26 minutes - and I feel bloody fantastic now. I feel like I've been ill forever, and only today have come out the other side. There's another parkrun special on tomorrow, I'll be going down to Basingstoke for that one, and then I intend to use the rest of the Christmas holidays to do a long bike ride or two, and some gym sessions. Getting back into the swing of things to start 2012 in a positive and productive place. 9 Months to Ironman WalesThere are now just over 36 weeks before the start of Ironman Wales 2012, and we know what a fantastic but challenging race this is! I volunteered at IM Wales in 2011 and knew as soon as the race was over I was going to enter for 2012. It's now getting very real. I've blogged a bit, on and off, about my triathlon adventures, but this is an attempt to chronicle this 9 month period of "taking it seriously". 9 months to go. I feel like I've just conceived!